HMRC require that the last RTI return for 2017-18 is marked as being the ‘Final Submission for Year’ (which Payroll Manager will automatically do for you via an EPS return). At year end you should file your FPS as usual on or before the final pay date of the year, and in addition to this Payroll Manager will schedule an EPS, which will serve as the ‘Final Submission’ for the year. This should be done on or before the last pay day for the period (as usual). In practice this means that you should have filed all of your FPS returns for 2017-18 by 5 April 2018. As this will be your last Full Payment Submission (FPS) for the year please take extra care to ensure that all details are correct as you won’t have the opportunity to correct any errors in subsequent FPS returns. Make sure that all new starters and leavers have been entered correctly and that all pay details are accurate and up to date. The final FPS for 2017-18 should be sent on or before the final pay date of the year in order to comply with HMRC regulations. If for whatever reason this is not possible, or if for some reason you need to resubmit an FPS then you must do this by 19 April 2018 at the very latest as this is the HMRC cut-off date for 2017-18 FPS submissions. If you miss this deadline you will have to use the HMRC Basic PAYE Tools software in order to submit an ‘Earlier Year Update’ (EYU). Payroll Manager cannot be used to submit an EYU. Bring up the RTI schedule (click ‘Pay – Employer’s RTI schedule’). You will see an EPS scheduled for 5 April 2018. (You can if you wish file this EPS before 5 April if you are ready to do so and there are no figures to report on the EPS – otherwise you should wait until after 5 April.) The ‘Due Date’ for the EPS is shown as 5th April 2018, but in reality you have until 19th April 2018 to submit this return, as this is the date by which HMRC require a return marked as the ‘Final Submission for the Year’. Note for CIS subcontractors: If you are a limited company and suffer deductions under the Construction Industry Scheme (CIS) then you should wait until you have entered these details (‘Employer – CIS Suffered) before submitting the final EPS for the year. In these instances you have until 19 April 2018 to submit this return. Click on ‘View/File’ to view the return. Check the details and then file the EPS when you are ready to do so. The final EPS also includes details of any Maternity, Paternity or Adoption pay that you are recovering in the year, which will be shown on this report even if the amounts are zero. You can now file the EPS to HMRC. What if I make a mistake on my FPS and need to send an amendment? – We would urge you to try not to get into this situation by ensuring that your payroll information is accurate and complete before filing your final FPS for the year. If however you do need to amend and resubmit your most recent FPS you have until 19 April 2018 to do so. Amendments after this date will NOT be possible through Payroll Manager and you will have to use the HMRC Basic PAYE Tools software in order to submit an ‘Earlier Year Update’ (EYU). To file an amended FPS return before 19 April 2018, see the relevant section of our guide on correcting RTI errors. I am an Agent – can I produce an annual summary report for my client? – Yes – click ‘Forms – Employer – End-of-Year Summary’ to produce a report similar to the ‘old’ P35. The ‘Layout’ drop-down selector at the top of the report allows you to choose how much detail you wish to show. 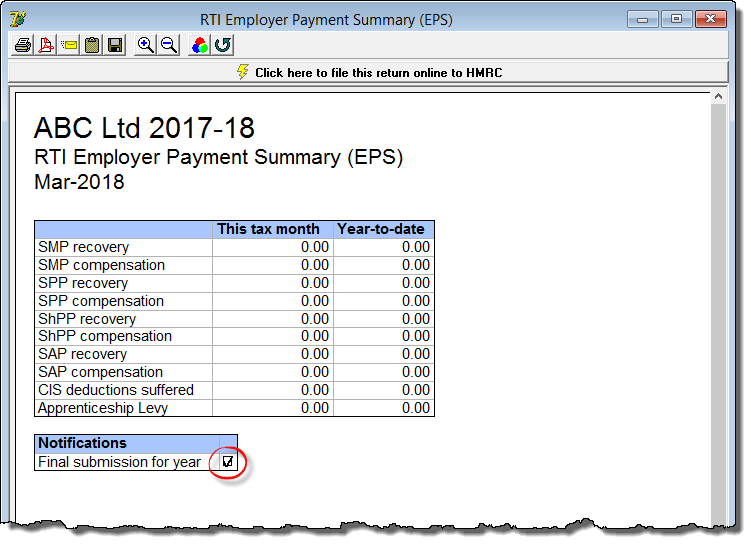 Some HMRC guidance suggests that the ‘Final Return’ information should be sent on the FPS – why does Payroll Manager not do this? – When designing the software we took the view that it is best to send this information via an EPS, allowing more time to complete the year end declarations accurately.